Dennis Prager, host of his own eponymous radio talk show, speaks about his religious and political views at an event hosted by the College Republicans. The author and lecturer is an advocate for both Judeo-Christian and conservative values. 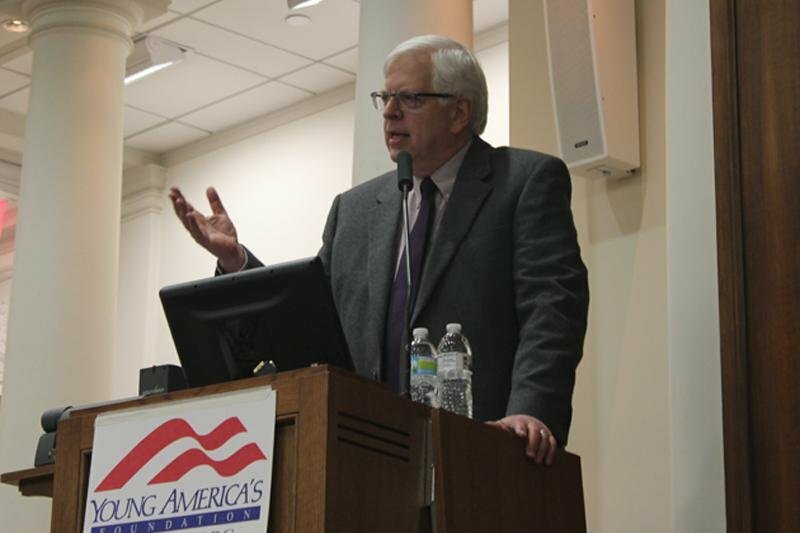 The Northwestern College Republicans hosted a speech Monday by conservative radio show host and columnist Dennis Prager, who spoke on what he considers fundamental American values. He spoke about the topic, “Why the World Needs American Values to Triumph,” and explained his views on the Judeo-Christian model of morality and how he believes it produces good people in America. The seats of Harris Hall’s Accenture Forum were filled by students and Evanston residents who came to hear Prager speak. The majority of the crowd consisted of older residents from the neighboring area, with about 75 students in the mix, said College Republicans president Dane Stier, a Weinberg junior. Prager opened the speech by thanking those who are “predisposed to disagree with me” for attending. He emphasized diverse viewpoints, joking to a laughing crowd that he subscribes to what he considers a liberal New York Times, despite how it “makes me lose my appetite,” and criticized liberals for ignoring the conservative perspectives they disagree with. Prager addressed his idea of the “American Trinity,” which he believes is key to America’s societal goodness. The three principles in question are liberty, which Prager considers being “free from the state,” and “In God We Trust” and “E Pluribus Unum,” two phrases found on American currency. “(The founders) understood you’ll have a free society if you’re answerable to God,” Prager said, adding that nowadays the state has replaced the presence of God in a less free society. He went on to explain “E Pluribus Unum,” praising America for being the “least racist, least xenophobic society in human history.” He criticized liberals for emphasizing the “non-issue” of race and said because Americans do not care about differing backgrounds, they do not discriminate. The audience’s reaction to Prager was largely mixed. Weinberg junior Michael Lamble said the speaker seemed like a “genial … kind fellow” with admirable theories, but they disagreed from practical standpoints. He cited Prager’s view that subconscious racism is not a problem in modern America as an example. Highland Park resident Michael Poll praised Prager for acknowledging other viewpoints while remaining tied to his own. Prager, who lives in the Los Angeles area, hosts the weekday radio show “The Dennis Prager Show.” He is also the author of “Still the Best Hope,” which discusses Prager’s views of the inherent goodness of American values.